Fourteen ESF students will travel to Puerto Rico this summer as part of a State University of New York (SUNY) and overall New York state effort to support recovery efforts on the island. SUNY is partnering with Gov. Cuomo's New York Stands with Puerto Rico Recovery and Rebuilding Initiative to support the ongoing work this summer. The work aligns with that of the SUNY Puerto Rico Task Force, which was established in October to support long- and short-term efforts to recover and rebuild a sustainable, resilient and vibrant Puerto Rico. ESF Chief of Staff Mark Lichtenstein is a member of the SUNY committee and traveled recently to Puerto Rico as part of an assessment team that joined Gov. Andrew Cuomo and other state representatives in an effort to identify how New York state building trades can help the island recover, working in conjunction with non-governmental organizations, with the involvement of students from SUNY and the City University of New York. The ESF students, along with a few staff members, will be among a SUNY group of more than 400 headed to Puerto Rico to assist with relief efforts. They will be housed onboard Training Ship Empire State VI, which leaves today (May 7) from the Maritime campus, bound for Puerto Rico. The trip marks the start of SUNY Maritime's annual summer sea term onboard the ship. Along with the Maritime cadets and ESF students, 30 students from SUNY Albany will participate in the effort. Their travel will be supported by funding from the college and the ESF College Foundation. Isabella Kaplan, who will graduate May 12 from ESF with a degree in environmental studies, said the students are excited about their accommodations because it means they will not be consuming resources that are in short supply. "They will only be having a positive impact," she said. "They will be volunteering but not using any resources." 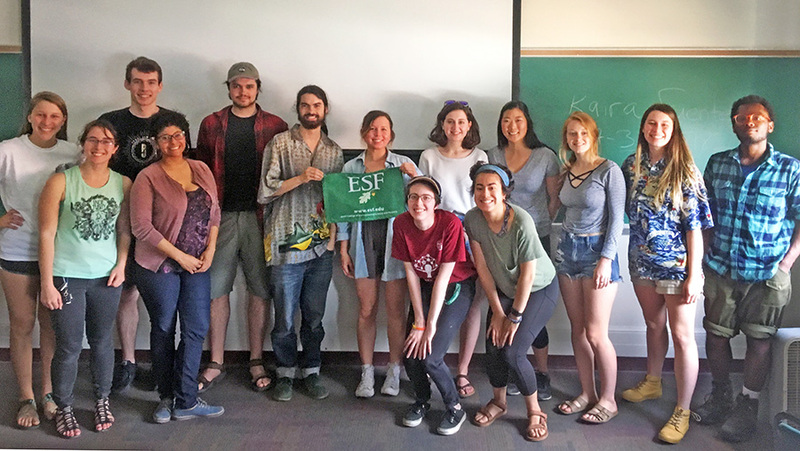 Kaplan helped organize the trip through her position as an intern in ESF's Sustainability Office, which is led by Lichtenstein, and her previous involvement in Acorns to Action, a student group that raised funds for disaster relief. She said 47 ESF students were interested in going on the trip. In the end 13 were chosen because of their skills and experience. "They either speak at least high school-level Spanish, or they have experience with disaster relief, or they have construction management skills or other relevant skill sets," she said. ESF senior Rachel Juritsch, who will graduate May 12 with a degree in sustainable energy management, will serve as student leader on the trip. "Last year's hurricanes are out of the news now, and people don't realize what is still going on in Puerto Rico," she said. "People there still lack basic services." One of the ESF volunteers is Lindsay Eberhart, a member of the Class of 2021. A native of Long Island, Eberhart said Superstorm Sandy turned her family's world "upside down" in 2012. "My house was completely flooded but luckily our church let us stay in one of its parsonages for four months while we were displaced. If it weren't for the volunteers and 'good Samaritans,' we would've been homeless and worst of all, hopeless," she said. "My mom would always say we were living on the other side of the television, so when the news station stopped covering the devastation and recovery was still occurring it was weird and it truly felt like no one cared anymore. It was similar to the situation in Puerto Rico; it's rarely shown through the news cycle anymore despite what is still happening. Even though I personally do not know anyone in Puerto Rico, I know their pain very well, so I am really looking forward to helping ease that." In preparation for the trip, ESF Ph.D. student Kaira Fuentes Viera, a native of Puerto Rico, met with the students in a workshop called, "Walking alongside Puerto Rico," to help them learn more about the Puerto Rican culture so they can be most helpful and build connections with local residents. Viera will be conducting research this summer for her studies in environmental and community land planning, and will be available in Puerto Rico to provide any support the students need. "I intend to communicate and train the volunteers going to Puerto Rico on key aspects of the history, politics, socio-economic issues (including the ongoing economic crisis), agriculture, environment, culture, traditions, food and everything they need to know about interacting with the residents in Puerto Rico," Viera said. "I will talk about the capacity of resilience of the Puerto Rican people, and how we have coped with the tragedy of Hurricane Maria. The goal is to raise awareness and promote cultural competency."